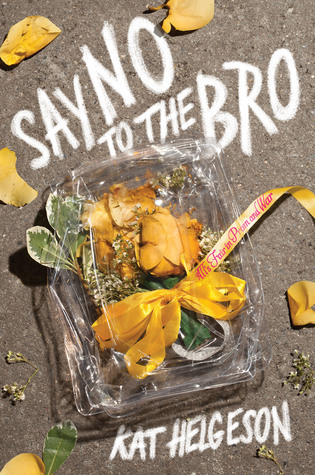 “Say No To The Bro”, by Kat Helgeson is a recent young adult novel published earlier this year! This is her first published book that she has written alone. She has worked with Hannah Moskowitz, and they together wrote “Gena/Finn”. “Say No To The Bro”, is engaging and caters to people from all walks of life. Ava is a senior at a brand new school, she moved with reluctance when her father became the new head coach of the football team. When her mother left, to start a new life, Ava felt an obligation to at least attempt some of her mother’s past responsibilities. Ava is determined to fly under the radar, and have a drama free year. But Ava is drafted into the “Prom Bowl”, which is a long-lasting tradition where the senior girls are entered into a competition and expected to compete against each other. The girls are auctioned off , and the highest bidder scores a date with one of the girls. All of the money is supposed to be used for the funding of their senior prom. Ava is the “Wildcard”, she is meant to “keep things interesting.” Ava wants absolutely nothing to do with this Prom Bowl, she thinks it is a outlandish event. But when the all-star quarterback of the football team Mark Palmer gives Ava a friendly face which she is not only smitten by, but see’s what may be her only way out of this Prom Bowl. They together team up to try and get Ava out of the Prom Bowl, but the attempts fail and leads to getting her more involved into the event. There is three main events, one is at homecoming, and at homecoming they are expected to dress their very best and then walk the runway. Next, they host a talent show, where the girls are expected to show off their best talent. Lastly there is a huge party that is hosted by the senior class president. When Ava and Mark see how these events start to spiral out of control they are forced to not only question the host but the school for allowing this to go on. This tradition is taken very seriously and has been going on for years. After seeing how the events aren’t always so family friendly, Mark and Ava start to realize how they need to put an end to this madness, especially when someone gets hurt. Not only do they have to consider their reputation at school, but their reputation to their new budding lives that are about to start. I would give this a 9/10 recommendation, because it has a well-developed plot and character development. The only downside of this book was that a big chunk of time seemed to be missing. It’s almost as if the story skipped ahead by quite a few months. Which left me with more questions than answers. That is truly the only critique I can give because this novel was a hard one to put down. I found myself in every spare moment I had, just escaping into Ava’s world and questioning her thoughts and actions. Personally, I usually venture towards a young-adult, and romantic type of novels. This novel gave me a little dose of romance, which was so sweet it made my teeth hurt.